Are these the best settings for BMPCC 4K footage in Resolve? 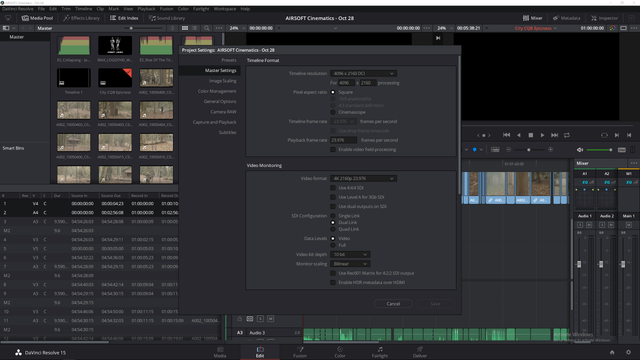 Thread: Are these the best settings for BMPCC 4K footage in Resolve? #1 Are these the best settings for BMPCC 4K footage in Resolve? I noticed anytime I start a new timeline with BMPCC 4K footage it doesn't change my timeline or video monitoring settings to 4K. I have to do it manually. Is there a way to make this automatic? These are my settings for the BMPCC 4K, pretty sure it's all good? Also, in :? : PROJECT SETTINGS is it okay to use 1080P for Timeline Format> Timeline Resolution and the Video Monitoring > Video Format settings to edit smoother and faster, as long as I put them back to 4K before export? Thanks in advance, love editing with Resolve instead of Premiere and the camera so far. BlackMagic is a great freakin' company! Best settings for BMPCC 4K in Resolve 15? Where is the Debayer Quality Settings in Resolve 14?